Home chuck dolph lungren Post repo man Television vandalay Chuck Returns! 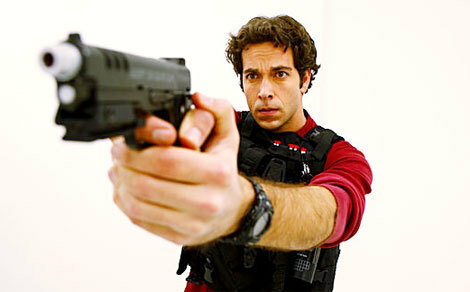 The world is a safer, happier place tonight.The big week of television returns started off with a bang tonight as one of my favorite shows, Chuck, returned for it’s fourth season. I’m not going to go over everything we’ve already seen, but I wanted to just touch on a few great things. First of all, this episode purely acted as a launching pad for the season. We got to see Morgan and Chuck working together, we got to see him come clean with Sara and enlist her help with finding his mom. We got to find out that Ellie is pregnant, which acts as a catalyst for Chuck keeping the mom secret from her (except NBC spoiled that with their previews for the upcoming season). And we got to see the Buy More come back into play as a new base fully run by the CIA. But the producers of this show really know how to have fun with their casting and story telling - and it’s those little things that really make this show great for me. 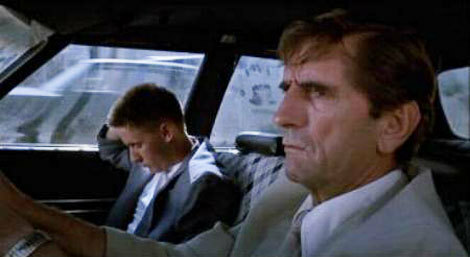 He was only on screen for two scenes and only for a few minutes, but the fact that Harry Dean Stanton was cast as the role of a repo man was nothing short of brilliant. For those of you who don’t know, Harry Dean Stanton has been acting for over 50 years and starred alongside Emilio Estevez in the 1984 cult classic, Repo Man (see below). So why he may have just seemed like some old guy cast in a throwaway roll, when you realize the thought that went into it you just have to give a nod of the cap to the producers. 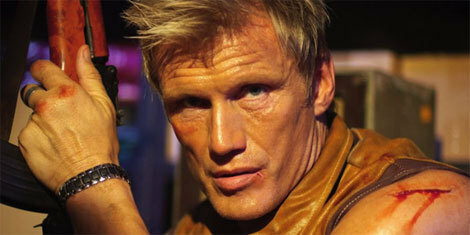 In a less subtle bit of stunt casting, former MIT student and Rocky IV villain Dolph Lungren was once again cast as a Russian bad guy. Just to hear him say the lines “I must break you” and “If you die, you die” after all these years makes you realize that the guy has a great sense of humor and the producers of this show really know their audience. And if you don’t think the 57 year old Dolph can still strike fear in the heart of a man, check out the story of how he foiled a robbery of his house without even being there. Did you happen to catch where we saw Chuck have his last interview? Vandalay Industries. Sure it’s a made up company - just not made up by the producers of Chuck. Vandalay Industries, headed by the fictitious Art Vandalay, was a company made up by Mr. George Costanza, from Sienfeld, as a way to impress people. Maybe this will job your memory. So, to recap quickly - happy as hell that Chuck is back. Great episode with some really great easter eggs. Those photos of Chuck and Morgan, master spies who use public transportation, were hilarious - and great guest casting (I don’t really count Olivia Munn as a guest casting because most people have no idea who the hell she is unless you’re a nerd like me). The only down side for me. No Awesome. No Jeff. No Lester. No Big Mike. I am sure we’ll be seeing them all soon, and they had to focus on the main four characters, but it would have been nice to see at least a glimpse of them.